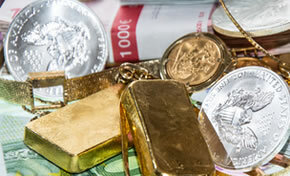 Precious metals futures ended lower Thursday. Silver’s loss was its first in five sessions with prices slipping slightly from a near three-month high while gold retreated from a one-week high. Gold for June delivery shed $4.70, or 0.3%, to settle at $1,348.80 an ounce on the Comex division of the New York Mercantile Exchange. "There was a bit of upward momentum, but you are still in the $1,300-$1,365 range. It’s more of a technical trade at the moment — it tries the upside again and if that doesn’t succeed then it falls back," Reuters quoted Dan Denbow, USAA senior portfolio manager. "Rates are up and dollar-supportive. The Fed still seems to be on the path for tightening. The Fed and cryptocurrencies, a bit, have been hampering (gold)." Gold futures traded between $1,343.20 and $1,357.70. They rose 0.3% on Wednesday to close at their best level since April 11, dipped less than 0.1% on Tuesday, and climbed 0.2% on Monday. After advancing in nine of the last ten sessions, silver for May delivery dipped less than a penny, or 0.05%, to finish at $17.239 an ounce. Silver futures ranged from $17.09 to $17.36. They surged 2.8% on Wednesday — posting their best settlement since Jan. 26, rose 0.7% on Tuesday, and edged up 0.1% on Monday. July platinum declined $5.70, or 0.6%, to $940.10 an ounce, trading between $935.40 and $957.40. Palladium for June delivery fell $8.50, or 0.8%, to $1,026.45 an ounce, ranging from $1,013.35 to $1,047.75.